"The Buddhadharma is not far off. It's as close as your mind. Reality is not somewhere outside. How can you find it, if you turn away from yourself. Whether you're deluded or awake depends upon you. Make up your mind, and you will be there. Whether you're in the light or in the dark doesn't depend on others. Have faith and practice, and you will soon know the truth. If you don't take the medicine of the Great Physician, when will you see the light of the sun?" -- Ming-K'uang - Disciple of the Tientai patriarch Chang-an. Twenty-five centuries ago a man awoke to a new reality, he was known as the Buddha. Without the aid of gods or men, he found his way through the tangled web of birth, sickness, old age and death into the everlasting peace of nirvana. The Buddha achieved his nirvana at the age of thirty-five. He shared and taught his practice for forty-five years. Buddhist practice is designed to end suffering, transform karma and halt all future rebirths. Buddhist practice includes both precept practice and meditation practice. The goal of precept practice is the transformation of speech and action. The goal of meditation practice is the transformation of consciousness. Buddhist practice is also about technique and discipline. Technique, the technical methods and procedures used in Buddhist practice are found in the eight-fold path. The eight-fold path is; right view, right intention, right speech, right action, right livelihood, right effort, right mindfulness and right concentration. Discipline in Buddhism, is the control gained by the practice of training precepts and meditation. The training precepts are; not to kill, not to take what is not given, not to indulge in sexual misconduct, not to lie and not to consume intoxicants. Buddhist meditation is composed of both tranquility meditation and insight insight meditation. Meditation allows the cultivator to see clearly, beyond a limited self view and facilitates positive change through heightened awareness. The practice of the precepts is a key support to the practice of meditation. The training precepts are a necessary and often overlooked component. The goal of nirvana hinges on a combination of precept practice, meditation practice and simplicity (renunciation). Over time a Buddhist comes to realize he or she has the power to change certain conditions through choice, and accept other conditions through practice. Choice and practice allow the Buddhist to actively participate in his or her own liberation. 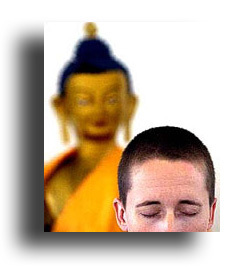 Skillful choice is a direct result of Buddhist meditation practice. Meditation adds clarity and understanding to the flux and change of everyday life. What seemed disconnected and arbitrary before, comes together in a web of interconnected cause and consequence. Karma is the cause, and vipaka (Pali word) is the consequence. Karma can be thought of as the transformation of energy through intention, speech and action. Karma is the principle of conditionality operative on the moral plane. The potential for suffering is found in every human desire, according to the Buddha. To end our suffering we need to end our desire for existence, for non-existence and for sense pleasure. Nirvana is the end of suffering, because it brings an end to those desires and cravings. It also brings an end to our karma and all future rebirths. Buddhist cosmology defines rebirth as the transmigration of karma from one life to another. Rebirth is different from reincarnation, as rebirth is not dependent on a soul. All forms of existence according to the Buddha are ultimately unsatisfactory because of impermanence. The early Buddhists did not believe in the existence of a permanent or fixed reality which could be referred to as God or soul. According to Buddhism what is apparent and verifiable about existence is the continuous change it undergoes. Early Buddhist teachings proclaim that in this world there is nothing that is fixed or permanent. Every thing is subject to change and modification. "Decay is inherent in all component things," declared the Buddha, our existence is in a state of flux and continuous becoming. Impermanence and change are the undeniable truths of the human experience. Rebirth can be viewed as a cause for suffering, sickness, old age and death. When the Buddha entered pari-nirvana - nirvana after death - birth was no longer a condition of his existence. His existence was now established in nirvana, beyond birth and death. Pari-nirvana is the ultimate transformation, beyond space and time. It is existence without birth! “O bhikshus! Do not grieve! Even if I were to live in the world for as long as a kalpa (336,000,000 years), our coming together would have to end. You should know that all things in the world are impermanent; coming together inevitably means parting. Do not be troubled, for this is the nature of life. Diligently practicing right effort, you must seek liberation immediately. Within the light of wisdom, destroy the darkness of ignorance. Nothing is secure. Everything in this life is precarious. Always wholeheartedly seek the way of liberation. All things in the world, whether moving or non-moving, are characterized by disappearance and instability. When the Buddha was young, he learned the science of medicine. He became knowledgeable about the nature and cure of diseases. The Buddha’s realization of the perpetual cycle of rebirth and the stages of aging, illness, and death, enabled him to guide others to live a healthy life. His pragmatic approach includes the insistence on proper hygiene and medicine, but more to the point, he never resorted to what might be considered "faith healing." Instead, he offered rational, practical instruction for dealing with both physical injury and mental illness. Early Buddhism gives us the five Niyamas, or the five aspects of cosmic order. These Niyamas deepen our understanding, and give meaning to why things happen. Niyama is a Pali term for cosmic order. The Niyamas show how certain conditions, laws of nature, work at different levels of cause and effect. The First Niyama (Utu Niyama) is the law of physical matter. It is the physical, inorganic order of existence. Seasonal changes, earthquakes, floods, gravity and heat are some of the many examples. It roughly embraces the laws of physics and chemistry. The Second Niyama (Bija Niyama) is the law of living matter, the physical organic order, like cells and genes, whose laws are similar to the science of biology. The Third Niyama (Kamma Niyama) is Karma. Karma is the activity of transforming energy through intention, speech and action. The result of this energy transformation is only considered wholesome or skillful if less suffering or no suffering is produced. Karma is the cause, and Vipaka is the result. It is the principle of conditionality operative on the moral plane. This sequence of cause and consequence replaces a divine law giver. In Buddhism there is a moral law, but no lawgiver and no one to administer it. This Niyama pertains to the world of ethical responsibility. The Fourth Niyama (Dhamma Niyama) is the Spiritual or transcendent. This principle of conditionality operates on the spiritual level. The natural phenomenon that occurs with the birth of a Buddha, and the reasons for Buddhist Practice are in this group. This Niyama has to do with the spiritual laws that govern ultimate reality. The Fifth Niyama (Citta Niyama) is mind. This Niyama implies mental activity such as consciousness, perception, conception, etc. Mental phenomenon arises because of conditions; the mind is not an independent agent. This is like the science of psychology. The Utu, Bija, Kamma, and Citta Niyamas are types of conditionality in the relative sense, the cause and consequence of everyday life. Dhamma Niyama has to do with the spiritual laws that govern ultimate reality, like emptiness, not-self or our progress through the different stages of the Buddhist path. These ever changing physical, biological, psychological, ethical and spiritual components give life to our pain and suffering. Our existence and ultimately our death and rebirth, or nirvana depend on a complex combination of aggregates. There is no 'One Thing' that determines anything in Buddhism it is always the interconnected and interdependent flux of many things. The Buddhist approach to health and healing is its emphasis on spiritual practice. Buddhism asserts that spiritual practice makes it possible for an individual not only to see opportunity for practice in the face of adversity, including sickness and injury, but use the opportunity for personal transformation and transcendence. Buddhist practice allows for a deep awareness of cause and consequence, and insight into the nature of conditioned interdependence. Choice and practice, are the two factors the Buddhist patient has most control over. As a result of precept practice, meditation practice and skillful choice, the Buddhist patient suffers less and has a greater sense of confidence and well-being. Practice can replace the feelings of being a victim with being a victor. Inspire the patient to view the world as being interconnected and living beings as brothers and sisters, and lastly to turn his or her thoughts towards nirvana and the welfare of all living things. Buddhism doesn’t tell the patient the meaning of sickness, so much as it tells him what he needs to do. Buddhism is a present moment path of action in life, sickness and death. The Buddhist patient can't change the past, but he does have some control over the future, if he can act with skill and clarity in the present moment. When medical professionals and Buddhist clergy work together, the Buddhist patient will have a greater sense of acceptance, be encouraged to focus on both mind and body, and in the process transcend pain and suffering. * A note on Buddhist words. Pali (Language of Early Buddhism) and Sanskrit (Language of India) are often used in the place of English when explaining Buddhism. It can be a bit confusing at first because of there similarity. For instance; Sutra (Sans) Sutta (Pali), Karma (Sans) Kamma (Pali), Dharma (Sans) Dhamma (Pali), Nirvana (Sans) Nibbana (Pali). Overview of Health/Illness: The goal of Buddhist practice is to develop the mind to its fullest potential which involves the perfection of compassion and wisdom. Spiritual well-being involves developing a compassionate mind and working with the suffering of illness and death in a maximally optimal way. Buddhist clergy, as well as lay practitioners are available to assist those who are interested in these practices. Birth: Buddhists believe in rebirth. In accordance with this belief, human birth is viewed as the beginning of a highly precious opportunity. Human birth is unique in that it is a rare opportunity for the complete development of the mind and practice of compassion. Abortion and Birth Control: Buddhists believe that conception occurs when consciousness enters a fertilized egg. This is considered the beginning of life and it is regarded as killing if the life of the future person is aborted after that point. Birth control that prevents conception is acceptable. Death: The time of death is extremely important to a Buddhist since this is a transition point to the next life. Buddhists devote considerable religious practice to preparing for death. It is very important for everything possible to be done to provide as much peace and quiet for the dying person, as possible. For the Buddhist, death is a series of stages involving disintegration of physical elements into more and more subtle elements until finally the consciousness leaves the body. The more composed and calm the mind is at death, the greater the opportunity for a better rebirth. Prayers are said for the person who is dying and sometimes a special text is read to the dying person. After Death: Once all of the stages of death have occurred, some Buddhists believe the consciousness enters a Bardo or intermediary spirit body, which is the precursor to the next life. The consciousness may remain in this intermediary form a very brief time or up to 49 days before the new life is begun. Immediately following signs of physical death, Buddhists believe that it is best to keep the body in a peaceful state. Traditionally, the body is taken to the home and for a period of 3 days or so, the body is not touched and extensive prayers are said. This facilitates the process of the persons consciousness letting go of its prior body and life and all of its attachments and more easily moving to the next. Bereavement: At the time of and following the death of a loved one (particularly the first 49 days), prayers are said for the person to achieve the most auspicious rebirth possible. Buddhists also meditate on the Truth of Impermanence -- a key Buddhist teaching, as a precious loved one leaves this life. Dietary Regulations: Within various branches of Buddhism, there are vegetarians, as well as non-vegetarians. Some branches have strict dietary regulations, while others have few. Personal Devotions: Buddhist devotions involve verbal prayers, mantra repetition, analytical meditations, as well as a variety of other meditation practices. Religious Objects: Common religious objects involve prayers beads and images of Sakyamuni Buddha as well as other Buddhist deities. Other religious objects are utilized for specific meditation practices. Special Care of Women: While men and women are viewed as equals in Buddhist philosophy, mothers are regarded as even more important than fathers due to their more primary role in bringing children into the world and traditionally taking care of them. Thus, when a mother is sick, special kindness is shown towards her. Holiday Observance: The major Buddhist holy day of the year is Vesak which is the observance of Sakyamuni Buddhas birth, enlightenment and parinirvana. This holiday falls on the full moon day of May. It varies from year to year as it is determined by a lunar calendar. In observance, some Buddhists fast for part of or all of this day. Bioethical Decision-Making: While Buddhists believe that it is good to continue living as long as possible, it is not believed that this should be done under all circumstances. For example, life support machines are not believed to be helpful if the persons mind is no longer alert. Having an alert mind and not being in excessive pain are the two primary factors that affect a Buddhist decision regarding the appropriate time of death. Once the conditions are quite difficult, it is believed that it is better to die. Allowing the person to die in a natural, peaceful manner is considered more essential. Privacy/Space: A quiet and peaceful atmosphere is most beneficial when one is sick or dying. This allows for the sick person to rest better, as well as to practice meditation and prayer. Visitors/Connecting With Community: Maintaining a calm and peaceful atmosphere for the sick person is again the essential aspect. Ethnic (Language) and Cultural Sensitivity: Maintaining a positive, caring attitude when interacting with the patient is the traditional cultural norm. How to Practice Buddhism in the Hospital. It's important to have a practice before you get sick, the more months/years of practice the better. The hospital is not the place to find Buddhist practice, it's the place to practice Buddhism. The practice of Buddhism starts with precept practice and meditation. Buddhism is about building a foundation of skillful Karma and the cultivation of mind; the five precepts and mental training. I encourage anyone new to meditation to start with Mindfulness and Loving-Kindness. Mindfulness and Loving-Kindness meditation can transform both the Buddhist patient and those around him. Below is an eBook packed with useful tips and insights on Mindfulness and Loving-Kindness meditation... It's a great place to start, and it's free. You can read it online or download it to your computer. It's 58 pages @ 2.7 MB... If you're like me with phone modem it may take a minute or two to download, but it's worth the wait. Hello - With Love & Other Meditations  Ven. Visuddhacara. Contents: Traffic Jam Meditation, Eating Meditation, And Drinking Too, Sleeping and Walking, Talking, More Tips: Note the Intention, Changing Moods, A Special Note on Anger and Sorrow, Sorrow, The Place of Loving-Kindness, Wise Reflection. Daily Readings -- Buddha's Words of Wisdom  by Ven. S. Dhammika.